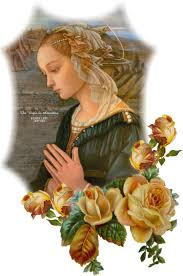 “God inspired in the heart of the pure Virgin Mary His own intense love for humility, and abhorrence of pride. She possessed, even from her infancy, a far greater horror of pride and ambition, and a far deeper love for humility than all the saints together. It was the first virtue that she practiced. She abased and humbled herself before all. She esteemed herself, and would have been happy to be treated by others, as the last of the creatures. By marvelous radiance of her Immaculate Conception, she beheld herself susceptible to the guilt of the children of Adam, except that God miraculously preserved her, and she considered that she might have been capable of all the sins in the world, whose source is original sin. It was this humility which attracted to her the countless graces which rendered her worthy to be the Mother of God, Queen of heaven and earth.